We are very proud to welcome you to our webpage. Our names are Philip and Bronwen and we are both very passionate and devoted to Tibetan Mastiffs, falling in love after our first encounter with this guardian of Tibet. Both having a keen interest in Asian history and having travelled extensively throughout Asia, we feel blessed with positive karma to be custodians of this unique, legendary breed. The Tibetan Mastiff is considered to be one of the oldest breeds in existence today and is often referred to as the “king of the dogs from the roof of the world”. We were captivated by this noble canine’s extreme intelligence and independent nature. They are so calm and patient, and so deeply loyal to family with such a natural rapport with children that you have no choice but to become deeply devoted. Please take time to browse through the many pages / hyperlinks that showcase Amitabha Tibetan Mastiffs. We undertake a limited and selective breeding program that strives to produce world class quality Tibetan Mastiffs with exemplary health, temperament, breed type and structural soundness. Tibetan Mastiffs only season once a year, having puppies during the winter months. As we have a waiting list for puppies, we suggest that you contact us early if you wish to be considered for a puppy. For people outside of the south-east corner of Queensland, we can happily organise transport for your puppy from Brisbane to your closest airport or to your door. We would encourage you to email us your phone number or call us on 0407 552143 or 07 54268838 to talk about the breed and our dogs to ensure this breed is suited to you. We have more than 10 years experience with the breed and have close association with International breeders with up to 35 years experience, to provide you with on-going support with your new family member. Health is of utmost importance in our breeding program. We have endeavoured to source dogs from breeding lines that have demonstrated good long-term health and longevity. All Amitabha dogs are hip and elbow scored, thyroid tested and veterinarian checked prior to mating. All hip and elbow scores of Amitabha TM breeding stock are considerably better than the breed average. All puppies are microchipped, vaccinated and wormed, and receive a comprehensive veterinary health check before joining their new family around 9 weeks of age. we feed all of our puppies and adult dogs superior quality food as complete, balanced nutrition is essential. We only use females for breeding who are physically and mentally mature (approx 3 years of age), resulting in balanced, well adjusted puppies. We breed and own TMs with temperaments that are ideally suited to Australian family life. Excellent feedback from puppy owners about their wonderful nature and ability to adapt to their new environment, life with children and other animals. Our dogs, exhibited at Brisbane Pet & Animal Expos, enjoyed 1000s of pats and cuddles from the general public, mainly children. We have all puppies temperament tested at 8 weeks of age, to contribute to our matching of puppy personalities to best suit their new homes. Our puppies undergo a desensitizing program to assist in the development of a balanced and healthy relationship with their new families. Conformation shows provide breeders with external quality control. Outstanding show results under a range of qualified judges demonstrates that the dog is viewed as a true and correct representative of the breed - in type and structure. All puppies are objectively evaluated at eight weeks of age by an external assessor for structural soundness, utilizing the internationally renowned Pat Hastings’ “Puppy Puzzle” method. Chinese publication in the "We love" book series - We love Tibetan Mastiffs - with articles about the leading breeders from around the world. As breeders, we have a responsibility to continue to enhance our knowledge of the breed and where possible, educate others about this unique and wonderful breed. We have an extensive library on Tibetan Mastiffs and general dog husbandry. This library undergoes continual expansion as world-wide research leads to new information. Bronwen is also undertaking Dogs Queensland conformation judges training for Utility Group dogs to enhance her knowledge of canine anatomy, structure and movement. 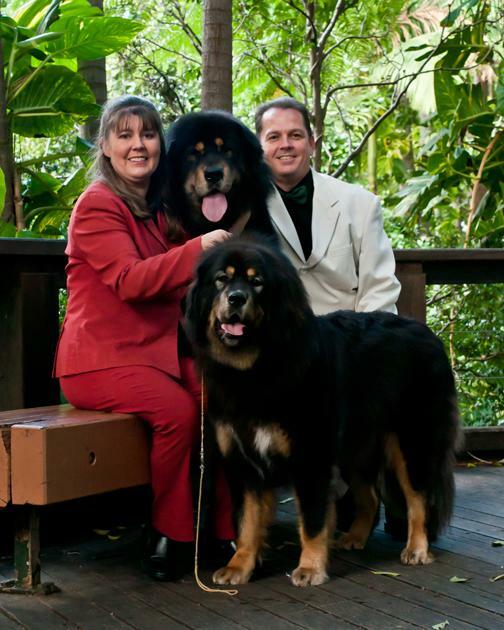 Travelled to Tibet and China in 2005, viewing TMs in their homeland and visiting numerous Tibetan Mastiff kennels. We support and abide by the Code of Ethics of the Australian National Kennel Council. providing owners with an understanding of the requirements for the care, welfare and responsible ownership of the dog, and that they have the time and facilities, e.g. adequate fences, sufficient room and proper shelter, to fulfil their responsibilities. Maintaining reasonable contact with the new owners of our dogs and to offer continued advice and reasonable assistance.